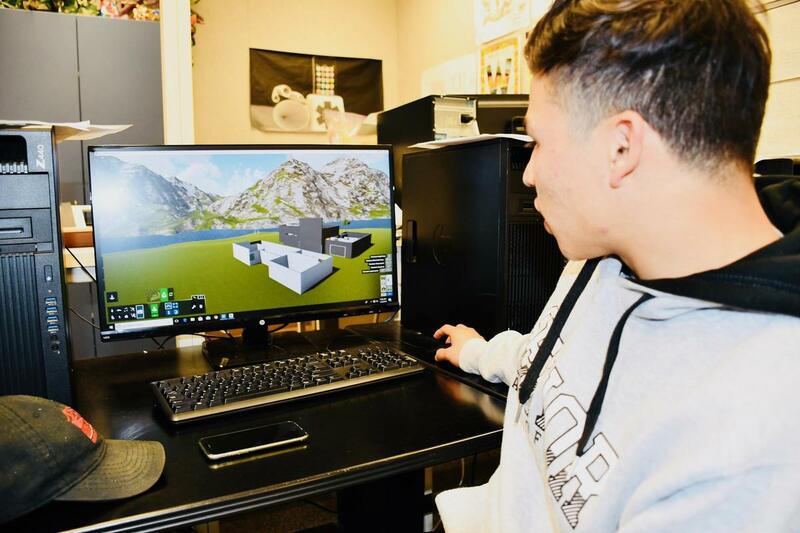 WALNUT, CA—In one of several bays of computers Walnut High’s advanced computer aided design (CAD) students are putting finishing touches on a guest house project using REVIT software. Senior Jack Chuang seamlessly clicks the toolbar to drag and drop in walls for a spacious kitchen, main living room, and bathroom. Next, he makes his architectural visualization come alive with animation and by choosing paint, tile, and wood flooring materials in the 3D Lumion program. Students add measurements, including the height of the future homeowners, to help test volume and determine the design of stairs for the home plans. “I’ve already learned a lot about drawing and composition while experimenting in this class,” Chuang commented. Everything is animated and realistic with virtual walkthrough tours using the rendering software, according to ROP teacher Mike Moore. “The trees move, you can make the stars twinkle in the sky, and even make it rain,” he explained. Sophomore Scotty Liu shows how he angled his home design and added a wall of glass so that the living room could take full advantage of the sunset. “You can do some cool stuff in Lumion,” he said while changing the color of the sky. For the past 14 years, Moore has headed up the 150-student career technical education (CTE) program that offers a blend of engineering and architecture skills. 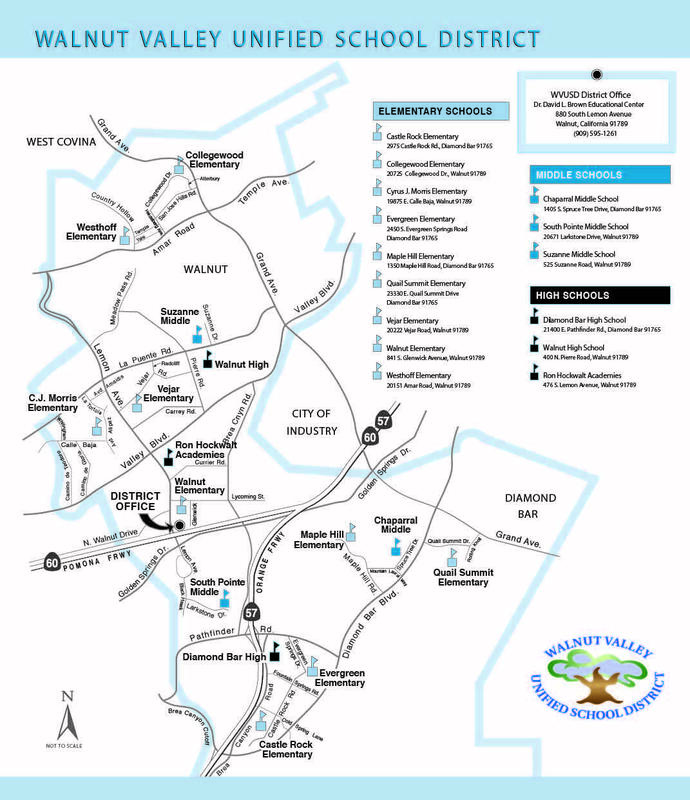 The classes are offered through a partnership with East San Gabriel Valley Regional Occupational Program and Technical Center. Every student builds an impressive portfolio of projects that include design, 3D printing, and animation. Students kicked off the new year with an assignment that could benefit their own school. The advanced CAD class has been tasked with creating an amphitheater covering to offer protection during sunny Southern California days and rain storms. The space may also include a charging station for cell phones and plasma screen to promote upcoming schoolwide activities. These teens are reaching for the sky as they work teams to measure the outdoor space, research products, and create design options using Revit architectural software. “Our group wants to cover an existing electrical box with a display to showcase student art,” said senior Justin (JJ) Lopez. “These students are getting great real-life experiences by working together and utilizing leadership and conflict resolution skills,” Moore said. The class will vote on the best design and present the ideas to school administration. “It would be so cool to see our ideas implemented!” Lopez added. 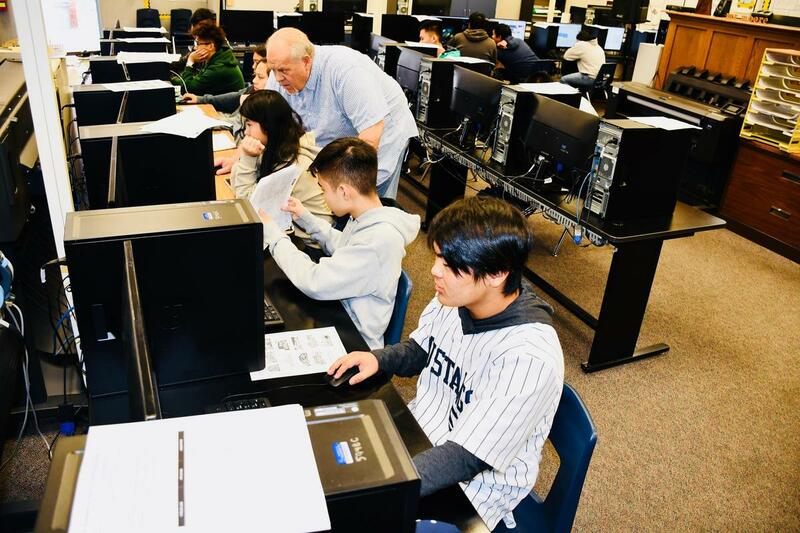 The kids start at “ground zero” in the entry-level CAD classes while learning how to create two-dimensional coordinates and basic shapes, according to Moore. 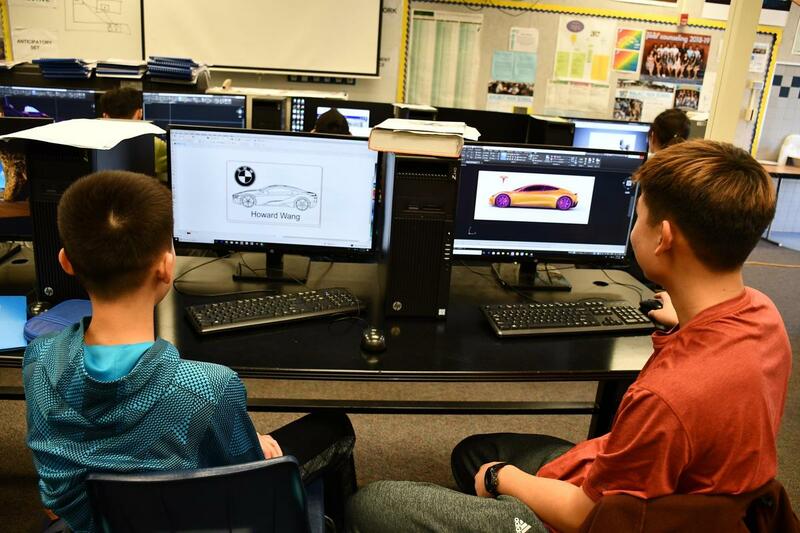 They rapidly move into more advanced assignments, like designing a dream car with orthographic projection and multi-views, in the 3D AutoCAD Inventor program. For the popular dream car project, students chose their favorite roadster, then imported an image to trace in Corel Draw. They personalize and add logos for the high-end speedsters in the AutoCAD program. “We use the arc tool to follow the curves of the car,” explained freshman Howard Wang while working on a BMW drawing. “And we use this circle tool to draw the wheel,” pointed out freshman Nicholas Heng while working on his fantasy car, a Tesla. “It’s more fun than doing drawings from a textbook,” Wang added. The large workroom is chocked full of computers, industrial supplies, 3D printers, a glass-encased CNC printer that uses a drill bit to carve photos, plaques, or other projects. While using the 3D printer, Moore’s advanced students are able to create products, like caster wheels, by drawing the part to size, printing it, and then assembling to check for accuracy. “This is engineering – and we can do it fast on these printers!” said the veteran teacher. 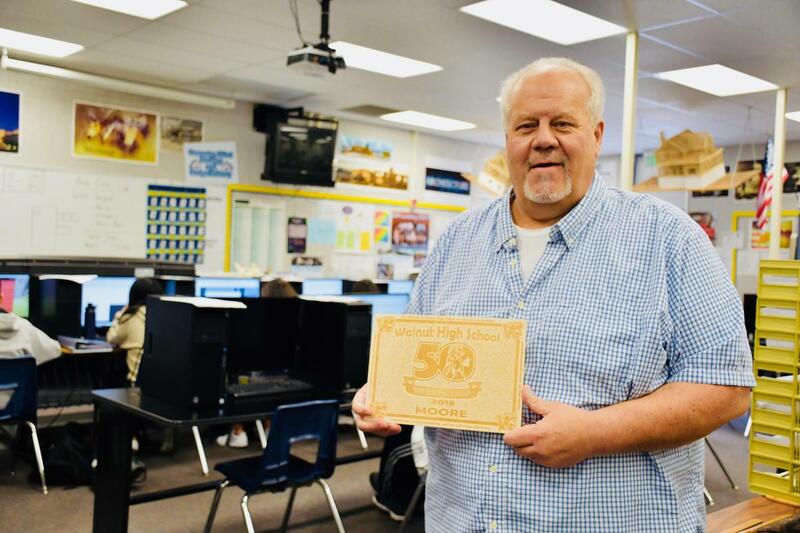 Last month, Moore partnered with applied arts teacher Mike Yamashiro to create a special gift to commemorate the school’s 50thanniversary. They surprised all 160 teachers and staff members on campus with personalized laser-printed plaques for the milestone event. After three decades in education, Moore is still passionate about introducing his subject each year. “I’m just the messenger who opens the door for students to learn about the field of engineering,” he said. 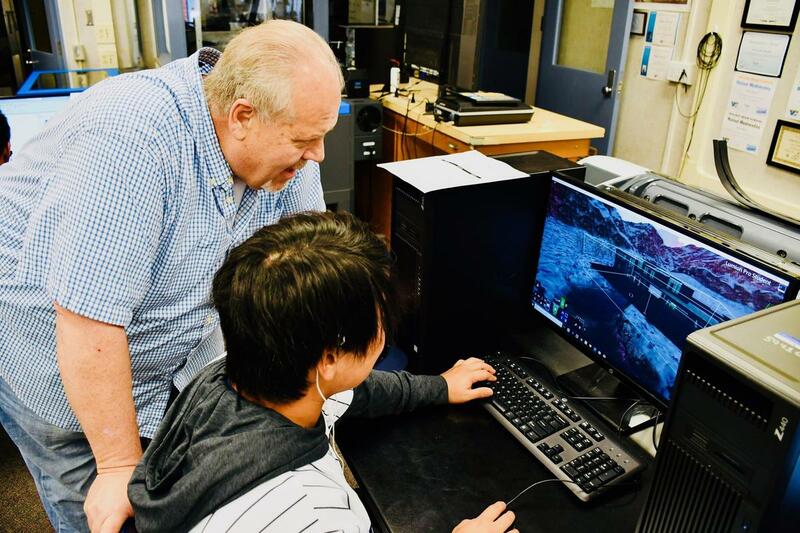 One former student, who now works at Raytheon, recently came back to thank his teacher for his patience as he struggled to become proficient with the CAD software. “If you become more successful than me, then I’ve done my job!” Moore told him. 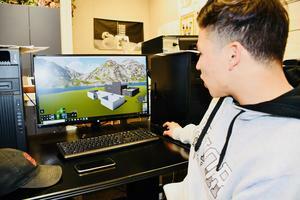 Walnut High senior Jack Chuang works on a home design in the advanced CAD class. 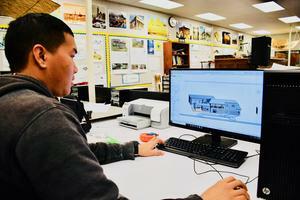 Walnut High students manipulate images in AutoCAD for the popular dream car project. 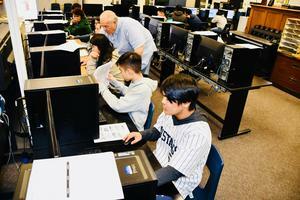 Walnut High students design dream homes in Mike Moore’s advanced CAD class on January 30. “I’m just here for the kids!” says Walnut High ROP teacher Mike Moore showing one of the 50th anniversary plaques on January 30.